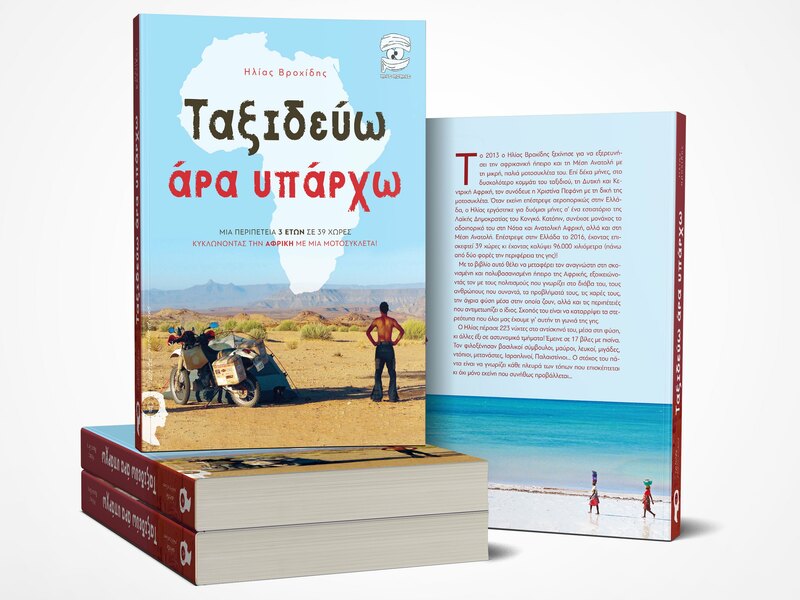 The book that describes my 3-year journey around Africa and Middle East is published by iWrite Publications by the title: “I Travel Therefore I Am”! 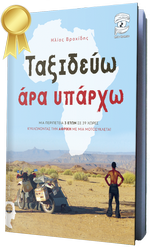 Unfortunately, it is available only in Greek at the moment. I am looking for a foreign publisher to publish it in different languages, so if you are working for one of them or if you are an agent and you like the idea, just let me know! 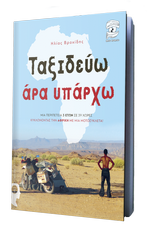 It is a book of 496 pages, including a collection of 80 stunning photos from Africa and Middle East shot during my journey. The book is based on my personal diary, which I had been writing every single night during my trip. This book does not target only motorcyclists, although I do describe my adventures on my motorbike, as it has been an undeniable part of my trip. I have gathered most of the technical details that would be interesting for motorcyclists in an appendix, in order to be available and useful any time. Unfolding the entire journey, I am trying to familiarize the reader with the civilization, the history, the religion and the problems of the local societies that I come to know, in order to understand and experience more vividly this transition to a different world. If you are in Athens or Thessaloniki, you can buy the book straight from iWrite Publications. If you want the book shipped to your doorstep, just write me your name, address and telephone number and I will post it. The shipping cost in Greece is just 2.60 euros, if you want to pay through a bank or paypal. It costs 2.30 euros more in case you need to pay on delivery. The shipping cost to Europe is 11,20 euros and 15 euros to Australia. Please, ask me for the exact cost to ship to any other country. 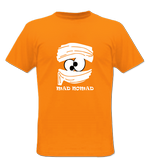 This is the only way for people who want me to sign the book and for those who want to combine in their order the “27 full moons in the East”, the “27 full moons in the East: colors and images”, any mad nomad T-shirt or a poster with a photo of mine. Of course, you can also buy “I Travel Therefore I Am” in a bookshop. You will find it in most big bookshops around Greece and Cyprus but even if they do not have it available, they can order it through iWrite Publications. 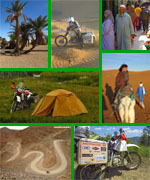 By purchasing one copy of “I Travel Therefore I Am”, you buy us fuel which lets us travel 250 km. (155 miles) more on one of our motorbikes! 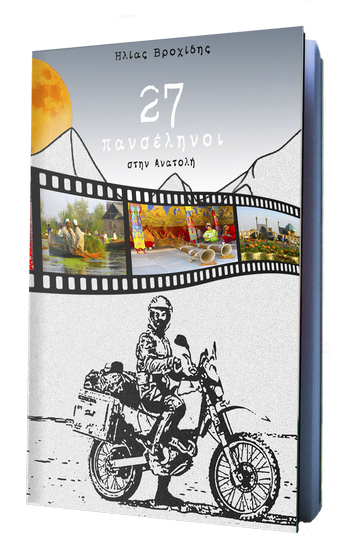 The third edition of my book that describes my odyssey in 14 Asian countries, for 2 years and 2.5 months, on a small, second-hand motorcycle, is in the market by the title: “27 full moons in the East”! It is a book of 390 pages, including a collection of 75 stunning photos from Asia shot during my trip. The book is based on my personal diary, which I had been writing every single night during my trip. Almost the whole book has been written in a small village in Armenia, where I have spent the winter with Andrea, the American volunteer that I had met there. This book does not target only motorcyclists, although I do describe my adventures on my motorbike, as it has been an undeniable part of my trip. I have gathered most of the technical details that would be interesting for motorcyclists in an appendix, in order to be available and useful any time. Unfolding the entire journey, I am trying to familiarize the reader with the civilization, the history, the religion and the problems of the local societies that I come to know, in order to understand and experience more vividly this transition to a different world. 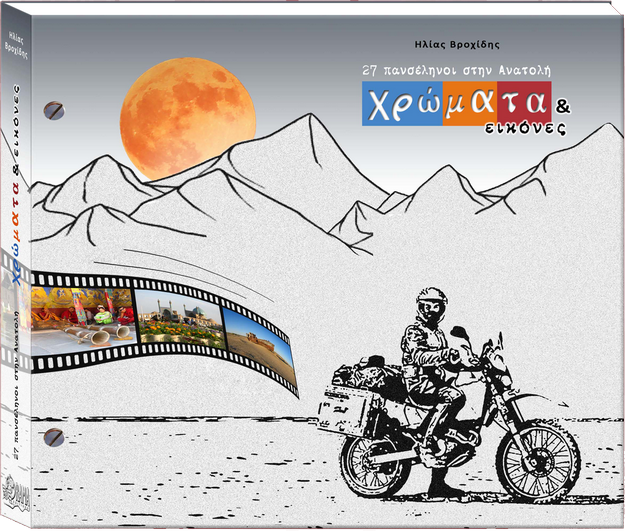 I had the pleasure of presenting my book, along with my journey, in various motorcycling clubs all over Greece and Cyprus, as well as in other social groups and bookstores. Despite the economic crisis that has hit the Greek society, people have shown great interest and have been overwhelmingly enthusiastic over my first writing attempt. As a result, the “27 full moons in the East” had been sold out within the first two weeks of its publishing! I would like to thank each and every one of those who support and encourage me. The edition of my book which you can find now is the third one. If you would like to read “27 full moons in the East”, you can contact me and have the book mailed to you. Its price is 18 euros. The shipping cost in Greece is just 2.60 euros, if you want to pay through a bank or paypal. It costs 2.30 euros more in case you need to pay on delivery. The shipping cost to Europe is 11,20 euros and 15 euros to Australia. Please, ask me for the exact cost to ship to any other country. By purchasing one copy of “27 full moons in the East”, you buy us fuel which lets us travel 200 km. (124 miles) more on one of our motorbikes! This is the coffee-table book that accompanies the “27 full moons in the East” book. It is a photo album of 266 pages, describing my 27-month odyssey in 14 Asian counties, through a collection of 417 photographs. Every image is being described by a short commentary text. These texts are only available in Greek, but this book is all about photography, anyway! As in every coffee-table book, the photos are in high resolution and the printing layout is in high quality paper of 26 x 22.5 cm (10.2” x 8.9”). This photo album, by the title “27 full moons in the East: colors and images”, is self-published in limited copies. That is an attempt to make my book affordable to everybody. Coffee- table books are usually of particularly high cost, as the entire printing is in color. Such a book is being sold in bookstores at about 50 euros! I made every effort in order to publish this book at the best possible price. So, you can now order “27 full moons in the East: colors and images” directly through me at 28 euros! The shipping cost in Greece is just 3.10 euros plus 2.30 euros, in case you need to pay on delivery. The shipping cost to Europe is about 12 euros but, please, ask me for the exact cost to ship to your country. If you would like to have my book, just write me your postal address and I will arrange its shipping. By purchasing one copy of “27 full moons in the East: colors & images”, you buy us fuel which lets us travel 180 km. (112 miles) more on one of our motorbikes!